“Anything can happen if you let it,” Mary Poppins repeatedly exclaims. And that includes producing a musical with 92 kids onstage, ranging from age seven to 18. J*Company youth theater artistic director Joey Landwehr has done it again — and this isn’t even a record! (he’s exceeded 100 participants in other shows). “Disney’s Mary Poppins” (music and lyrics by Richard M. Sherman and Robert B. Sherman, with additions by George Stiles and Anthony Drewe) presents a formidable challenge; there’s a fair amount of dancing required (choreography by Erin Peterson) and frankly, not everyone is up to the task. That’s also true for slow and precise articulation. And what about those cardboard muttonchops? The set design has the Banks home nearly up against the rear wall, so a considerable amount of the action takes place upstage, which doesn’t help the emoting part – even with (sometimes variable) mics. However, there’s bouncy energy throughout, and excellent strength at the center: 16 year-old Gabi Leibowitz is a stunning Mary Poppins. With her impossibly high cheekbones; regal, unflappable manner; smooth, effortless voice; and stellar stage presence, she inhabits the role to a T. Likewise Mitchell Mapes as Bert, the chimney sweep. This is only the second show for this 18 year-old, who was a varsity lacrosse player till 1-1/2 years ago, when he auditioned for J*Company’s “West Side Story” and became one of the Jets. This is his first leading role, and he’s quite impressive. He effectively captures a Cockney accent (though he could slow down, clarify and project more), he sings well, and he moves with agility. With additional training, experience and control, he should become a bona fide triple-threat. 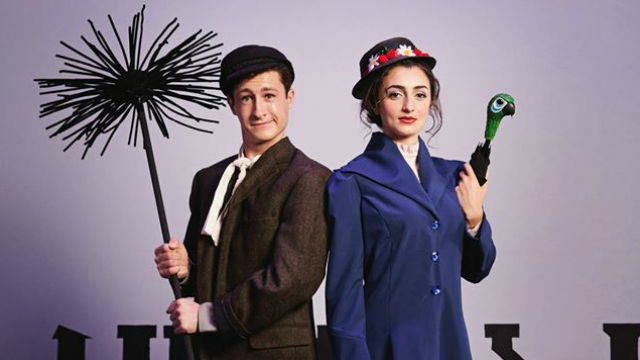 The Sadr siblings, Nika and Kourosh, are talented, spirited and adorable as young Jane and Michael Banks, who get Mary Poppins as a Nanny just when they need her most. She teaches all the Bankses how to re-set their priorities and put family first. Love conquers all — including job stress and marital strife (the 2004 show’s book, by Julian Fellowes, is darker and richer than the 1964 Disney film; both are based on the series of children’s books written by P.L. Travers). It’s rare for the J*Company to have taped rather than live music, but it works fine for this busy production. What the company does best is provide a positive, collaborative theatrical experience — as it grooms the theatermakers of tomorrow. The show teaches some valuable lessons — and so does J*Company. Its year-old ‘Random Acts of Culture’ program continues this Thursday, providing 500 free tickets to under-served families. The final performances are Sunday Nov. 1 at 1 p.m. and 4:30 p.m.